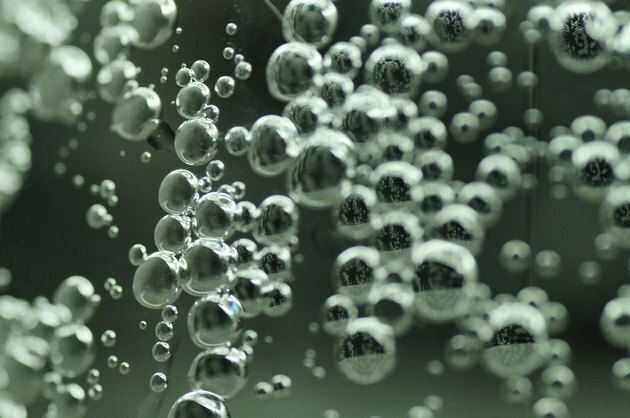 Carbonated water, sometimes called fizzy water, club soda, mineral water and a variety of other names, is merely drinking water with added carbonation, either from a chemical process, as with seltzer water, or through the introduction of pressurized gas to create bubbles or "fizz." Carbonated water is safe to drink, although it may exacerbate the symptoms of some digestive problems. Colas, fizzy drinks that include caffeine and phosphoric acid, can lead to weaker bones, but carbonated water will not cause mineral loss, according to a study published 2006 in the "American Journal of Clinical Nutrition." The human study found that only the intake of colas, and not other carbonated soft drinks, including carbonated water, causes low bone mineral density. Fizzy water can lead to extra gas in your digestive system, which, while not necessarily dangerous, can lead to burping or flatulence. Gas in your digestive tract can also be increased if you drink carbonated water too quickly, which may lead to extra swallowed air -- something every one does in small amounts when they eat or drink. If you have a digestive condition, such as irritable bowel syndrome, extra gas from carbonated water may cause more bloating and discomfort in your abdomen. Heartburn, also called acid reflux or gastroesophageal reflux, happens when the sphincter between your muscle and esophagus allows the contents of the stomach to regurgitate up slightly into the esophagus. This creates a burning sensation in your chest and stomach area that can be potentially dangerous if it occurs frequently. The extra gas in carbonated water creates more pressure in your stomach, increasing the chances that your stomach will regurgitate contents upward. Some carbonated waters also include natural flavorings, such as lemon or lime, which can increase acidic content, making the heartburn worse. Ulcers, namely peptic ulcers, are when you have open sores in your stomach, small intestine or esophagus. Like with heartburn, carbonated water can increase the pain of an ulcer, as well as further irritate it. While heartburn is a symptom of an ulcer -- the pain of an ulcer is often worse, and it is not relieved by taking antacids. If you think you might have an ulcer, especially if you are feeling a sharp pain in your abdominal area, are vomiting blood or have blood in your stools, speak with a doctor for emergency medical attention. TheKitchn: What Is the Best Fizzy Water for Your Cocktail? Can Drinking Orange Juice Flare Up Pain in the Lower Stomach? Can Coke Give You Bloating? Does Drinking Water Reduce Bloating?